South America's fifth-largest city (after São Paulo, Buenos Aires, Rio de Janeiro and Lima) sprawls across a plain at altitude 2,610 m (8,563 ft). The Andes rise to 3,300 m (10,827 ft) on the city's east side [see map]. Bogotá is the continent's third-highest capital (after La Paz and Quito). Its population was about 100,000 in 1900, was about 700,000 in 1950, and is about seven million today. The first railway was a horsecar line that began carrying passengers in 1884. A short steam railroad opened in 1889, but because of the country's rugged terrain Bogotá did not have rail access to a navigable river until 1909, or a direct rail connection with a seaport until 1961. Both the horsecars and the first electric trams, built in 1907 [see The Tramways of Bogotá], were disassembled and carried up the mountain on the backs of mules. Most of the city's horse trams and electric trams were built by J. G. Brill in Philadelphia, Pennsylvania, USA. The city's first 20 trolleybuses were built in 1947 by a Brill affiliate, Canadian Car & Foundry, in Fort William, Ontario, Canada. They were numbered 1-20 and later renumbered 1001-1020. Not many photographs of the city's early trolleybuses could be found. 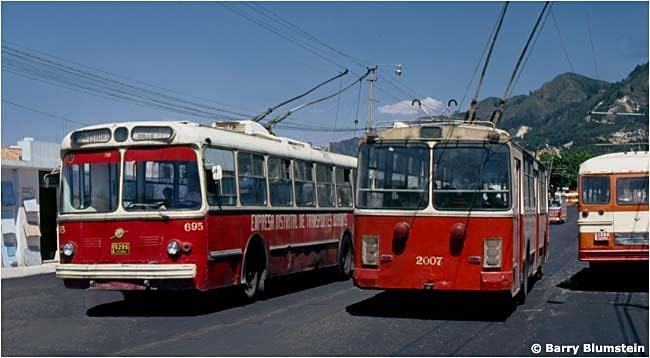 The 1962 page of the Historia del Transporte Público en Bogotá shows pictures of trolleybuses 19 and 26. 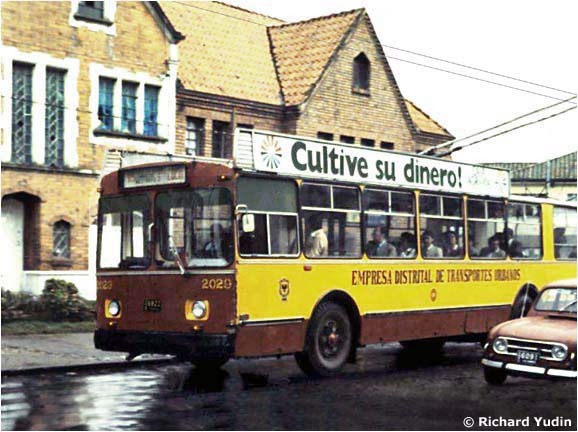 The latter is one of the 10 trolleybuses that Bogotá purchased from Baltimore in 1957, which Brill had built for that city in 1948. Destination sign says "8 / 12 DE OCTUBRE". 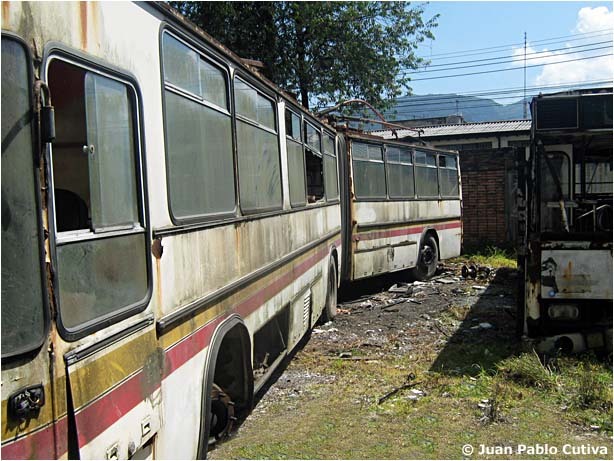 A Buses de Colombia page presents 23 photographs of Bogotá trolleybuses in scrapyards in the 1990s. 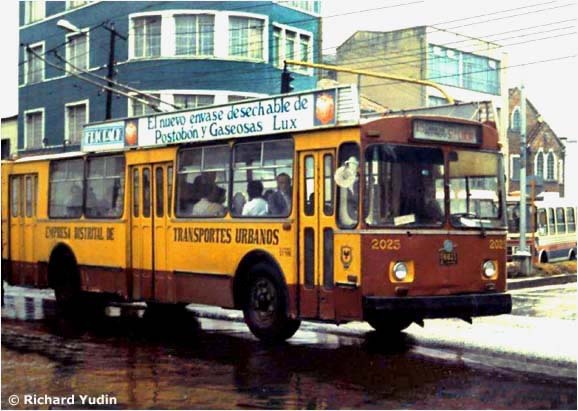 The third picture on the Latin America page of the St. Petersburg Tram Collection of Russia shows the model that it produced of the Pullman trolleybus that Bogotá acquired from Greenville. 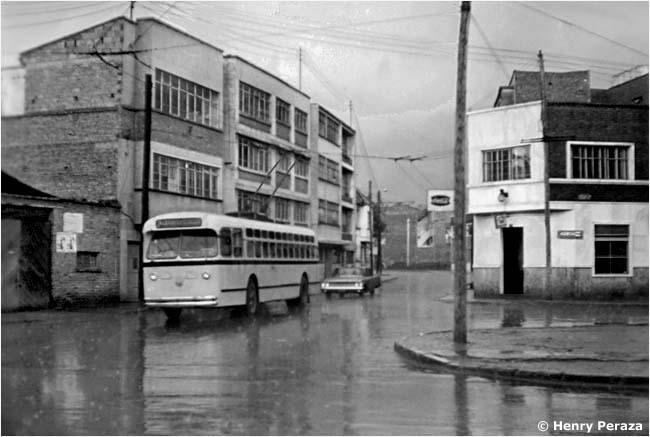 The page also shows models of Bogotá's ZiU and Brill trolleybuses. The Colombian government's Estadística del Distrito for 1965 reported 34 trolleybuses in service on three routes: #8 / 12 de Octubre – Quiroga; #9 / Centro Nariño – Quiroga; and #12 / Minuto de Dios – San Cristóbal [see map]. 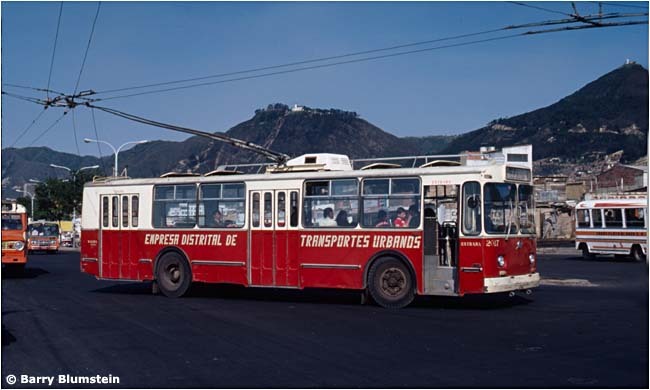 The 1966 Estadística reported only 27 trolleybuses in operation. 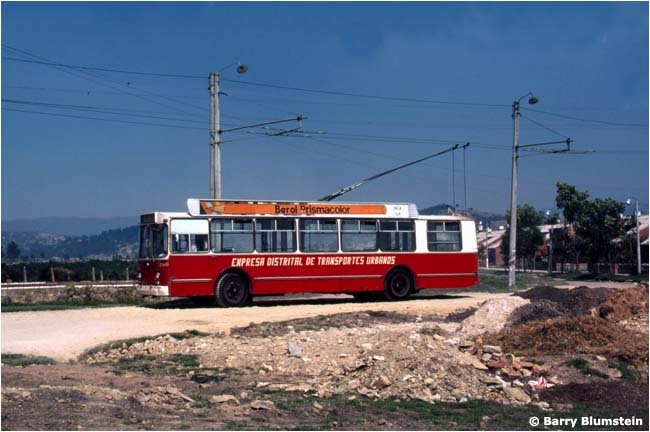 The three routes were the same in 1966, except that the southern terminus of #8 had moved from Quiroga to San Isidro. 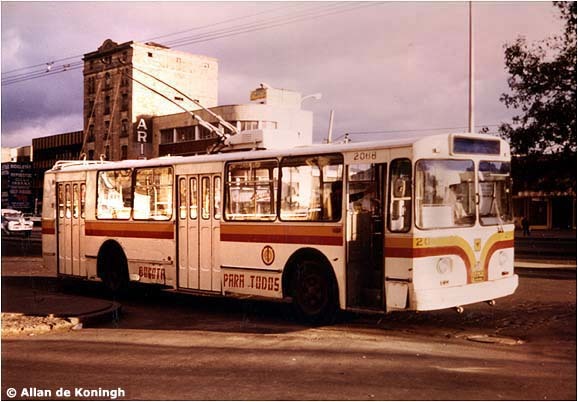 Two-thirds of the trolleybus fleet was out of service. 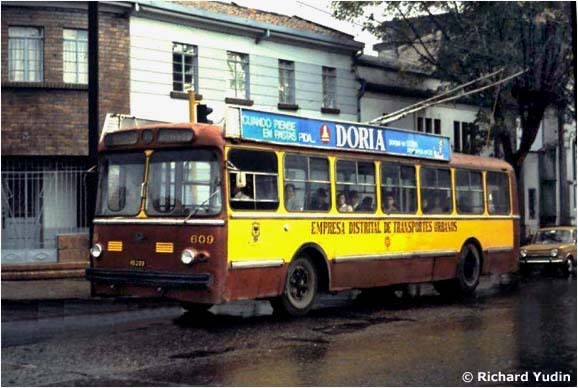 In 1967 EDTU purchased 100 new type ZiU-5 trolleybuses from Uritsky in the U.S.S.R., which it numbered 600 to 699. New trolleybus services were established on Carreras 14, 17 and 24 and nine branches of these lines spread north, south and west [see map]. Each branch was extended as the city grew. The new Soviet vehicles shown above left Santa Marta shortly after these pictures were taken. But it is not known how many, if any, of them ever ran in Bogotá. 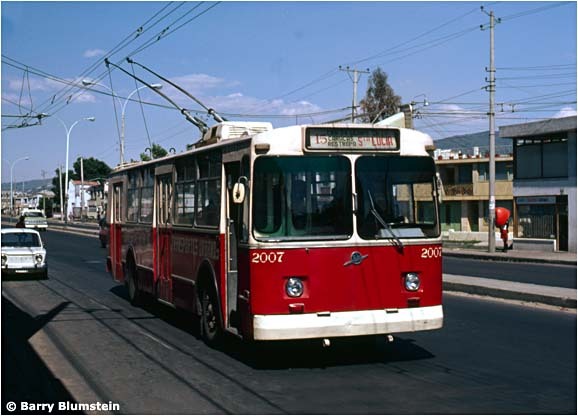 In the previous four decades, since 1947, Bogotá seems to have purchased – if not operated – at least 443 trolleybuses: 20 new from CCF-Brill in Canada, 70 second-hand from U.S. systems, 247 new from Uritsky in the U.S.S.R., and 106 from DAC in Romania. But maintenance was uneven and a 1990 newspaper article described the system as "in a permanent state of ruin" [see BIBLIOGRAPHY below]. 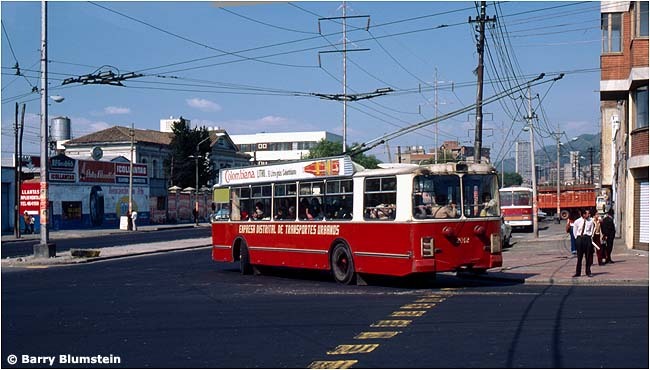 A 1991 article said that only 80 of 250 trolleybuses were in service, and that of 195 km of wire only 125 were in use. Russian engineers were summoned to Colombia to try to save the system. 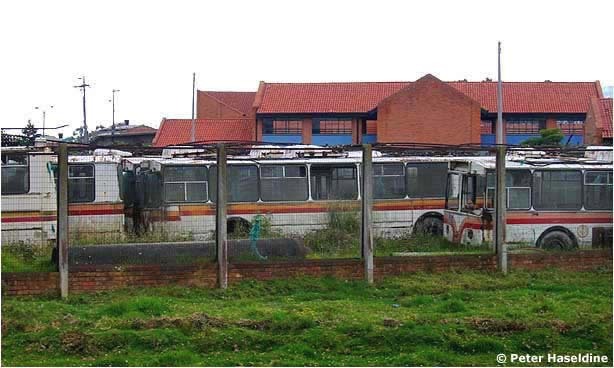 The engineers reported that most of the vehicles could be recuperated and a new company, Trolebús Bogotá S.A., was formed to run them. But it was no use. 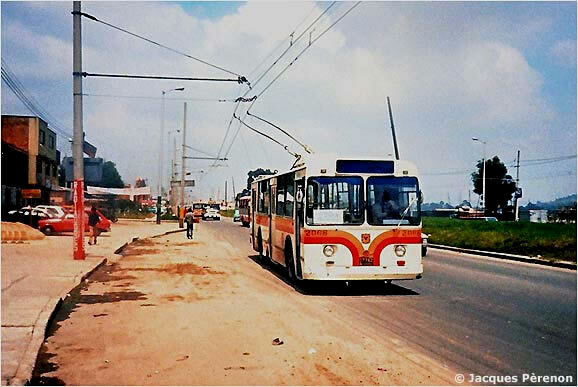 The last trolleybus in Bogotá operated on Thursday night 15 August 1991 and the Empresa Distrital de Transportes Urbanos was liquidated at the end of that year. 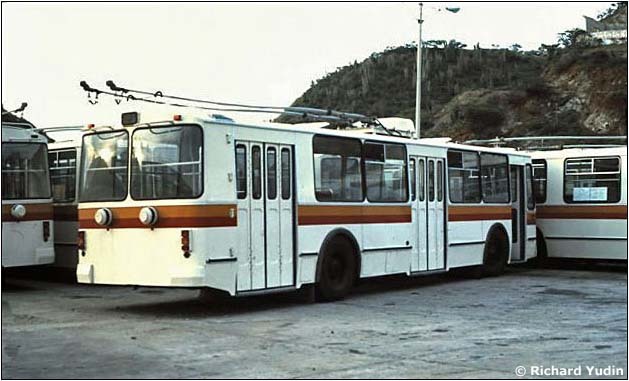 The trolleybus company in Valparaíso, Chile, expressed interest in buying some of the vehicles, and the trolleybus line under construction in nearby Quito, Ecuador, considered them as well. But nothing happened. 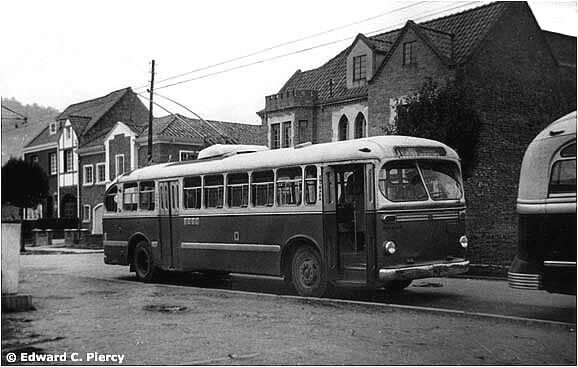 The surviving trolleybuses were gathered at the depot on Av. Chile and in a field near Parque Jaime Duque at Briceño, 40 km north of the capital. Many of the vehicles had never carried passengers. A newspaper editorial lamented "the poor man's funeral" that was accorded a vital chapter in the city's transport history. 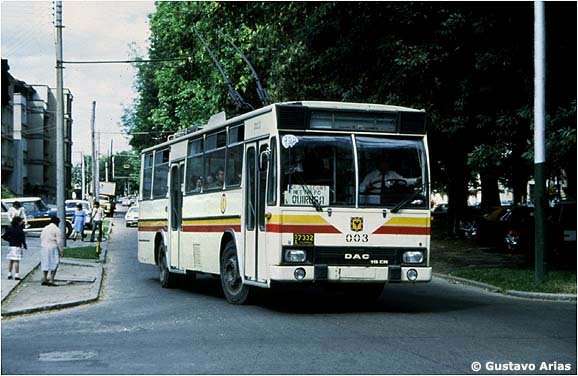 Bogotá inaugurated the first section of its reserved-lane diesel bus system called Transmilenio on 1 January 2001. 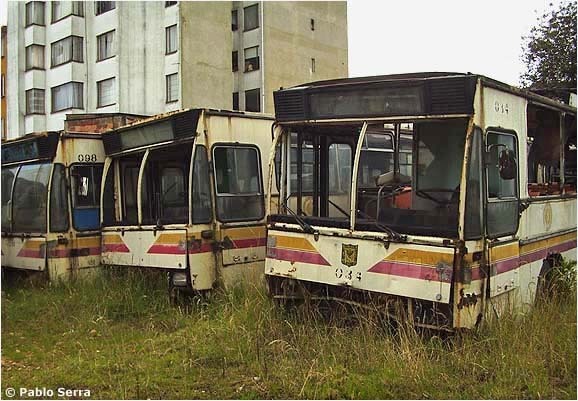 Number 209 and thirty other trolleybuses were still sitting in that yard in July 2013, twenty-two years after the system closed. Bogotá. Registro Municipal, 30/9/1941, p. 546. U.S. transport consultants recommend that Bogotá replace its trams with buses de gasolina y de trolley. The first trolleybuses will run on Av. Caracas. Bogotá. Registro Municipal, 14/11/1947, pp. 560-561. The 20 new trolleybuses will start running on Calle 26 in early 1948. Bogotá. Registro Municipal, 17/3/1948, pp. 84-85. Description of the new trolleybus line on Calle 26. Plans for future trolleybus lines. 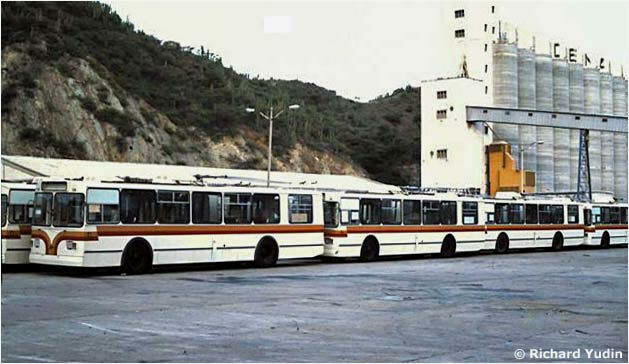 "17 Buses de Trolley Servirán en la Línea Av. Chile - San Francisco" in El Tiempo (Bogotá), 16/6/1948, p. 3. 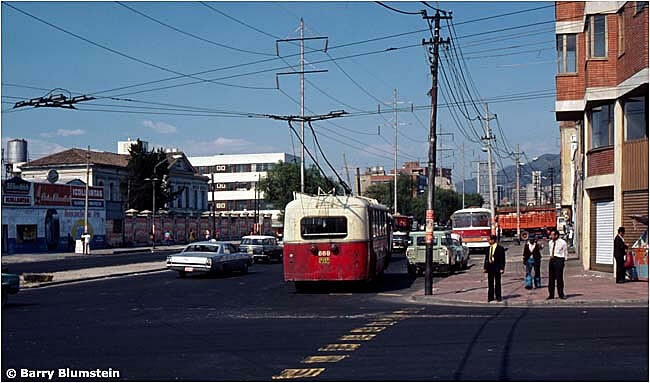 The 17 trolleybuses that will open the new line are the same as the three that have been running for several weeks on Calle 26. "Mañana se inaugurará la línea de trolley hasta la plaza de Los Mártires" in El Tiempo (Bogotá), 5/10/1948, p. 3. Inauguration of the city's second trolleybus line. Bogotá. Departamento de Estadística e Investigación Social. Anuario Municipal de Estadística, 1948. Data for the Tranvía Municipal, pp. 164-167. This government survey divides data into two groups – before and after 9/4/1948, the day when rioters destroyed government buildings and 28 trams (but not the 20 trolleybuses). 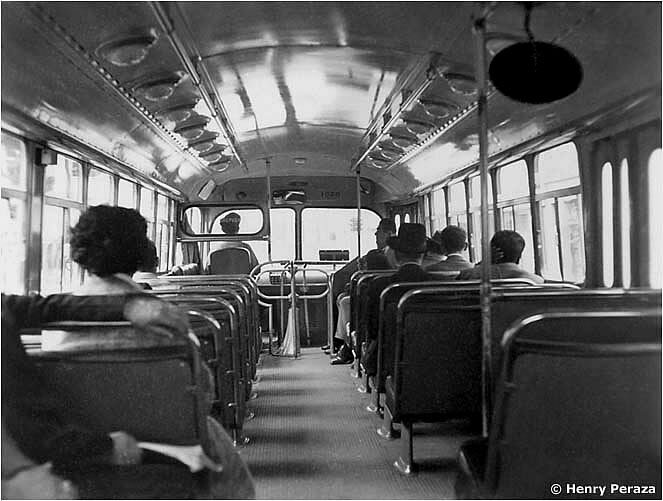 The chart on p. 166 indicates that three trolleybuses were serving the Ciudad Universitaria line from 12/4/1948. Bogotá. Departamento de Estadística e Investigación Social. Estadística de la Ciudad de Bogotá. Tranvías y Buses Municipales. Trolleybus stats: 1949 edition, p. 187; 1950 edition, p. 176; 1951 edition, p. 182. Bogotá. Departamento de Estadística e Investigación Social. Anuario Municipal de Estadística. Data for the Empresa Distrital de Transportes Urbanos: 1965 edition, pp. 194-196; 1966 edition, pp. 194-196. 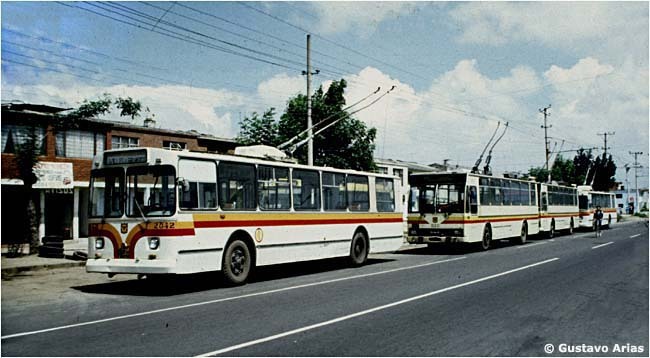 Vehicles in service, kilometers traveled, passengers carried, fare receipts, etc., for each of the city's trolleybus lines. "Acuerdo para liquidar la empresa de buses" in El Tiempo (Bogotá), 7/12/1990. Plans to liquidate the EDTU, which is in a "permanente estado de ruina". Only 27% of its vehicles are in service. A new company may be formed to operate the trolleybuses. "Liquidada la Empresa Distrital de Buses" in El Tiempo (Bogotá), 26/2/1991. Liquidation process has begun, but the trolleybuses may be saved. EDTU owns 250 trolleybuses, but only 80 are in service. There is 195 km of wire, but only 125 km is used. 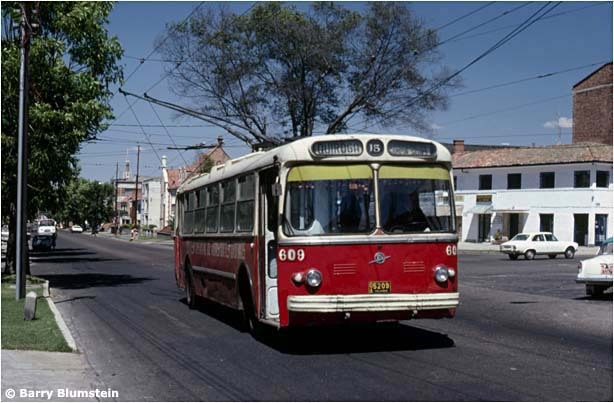 Russian engineers are in Bogotá to study the possibility of restoring trolleybus service. 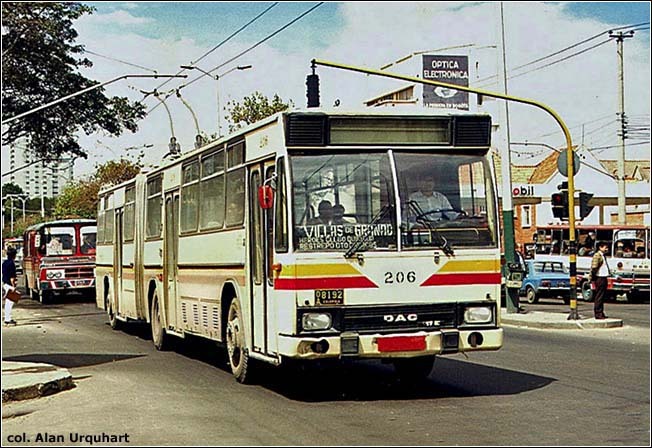 "La Empresa de Buses no se debe vender por chatarra" in El Tiempo (Bogotá), 23/5/1991. The EDTU should not be sold for scrap. 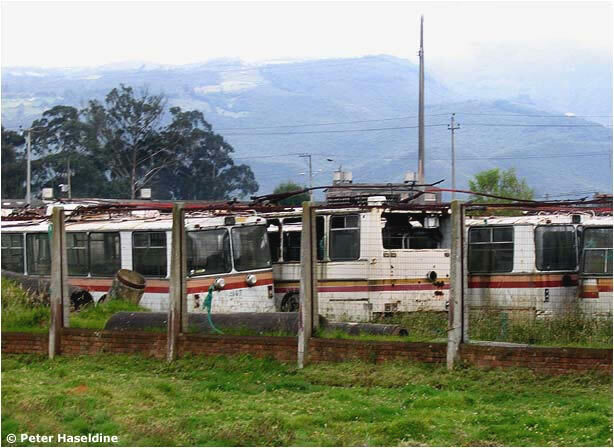 95% of the trolleybus fleet can be recuperated and a new company called Trolebús Bogotá S.A. can run them. "Interinidad en seis empresas del Distrito" in El Tiempo (Bogotá), 3/9/1991. 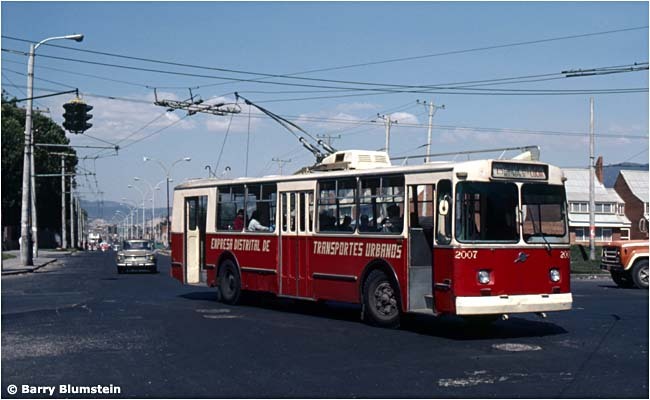 A Chilean company is interested in buying EDTU's trolleybuses . . .
"Año nuevo, ¿empresa nueva?" in El Tiempo (Bogotá), 24/12/1991. EDTU will be dissolved at year's end. Trolleybuses have not run since last 15 August. This is the only statement of EDTU's closing date that the author could find. No mention of the event was found in any edition of El Tiempo during August 1991! "Trolebus [sic] recibió entierro de pobre" (Trolleybuses got a poor man's funeral) in El Tiempo (Bogotá), 23/5/1992. 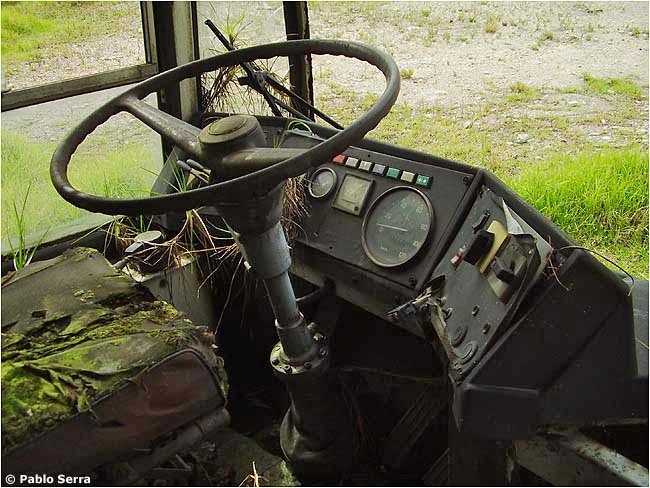 The new trolleybus company died before it was born. 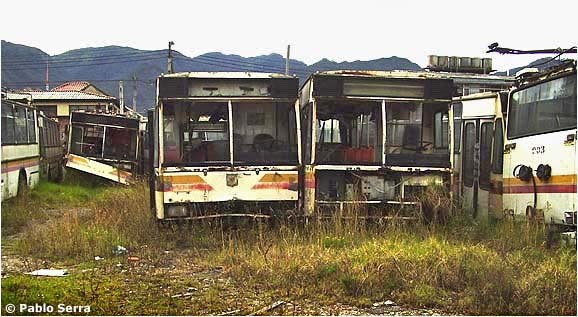 250 trolleybuses rot in an open field. "Los 'trolleys'; nostalgia eléctrica en subasta" in El Espectador (Bogotá), 26/5/1996, p. 1-F. Plan to refurbish the rotting trolleybuses, install gasoline motors and run them again. Two large photographs. Alan Murray. World Trolleybus Encyclopaedia. Reading (U.K.), 2000. 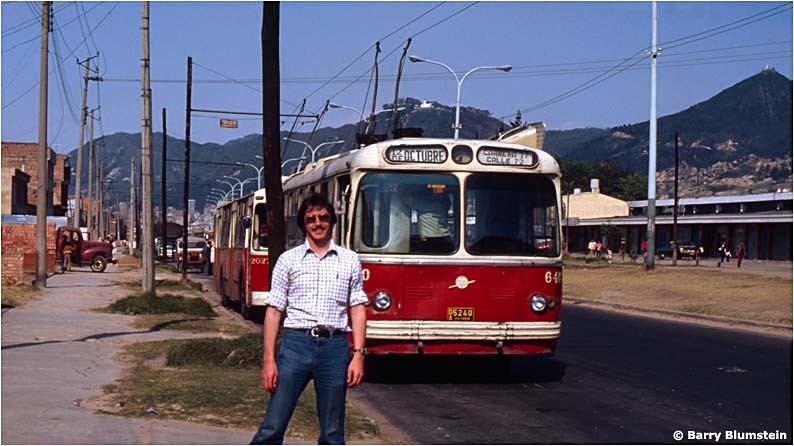 Brief description and data for the Bogotá trolleybus system, pp. 48 and 81. 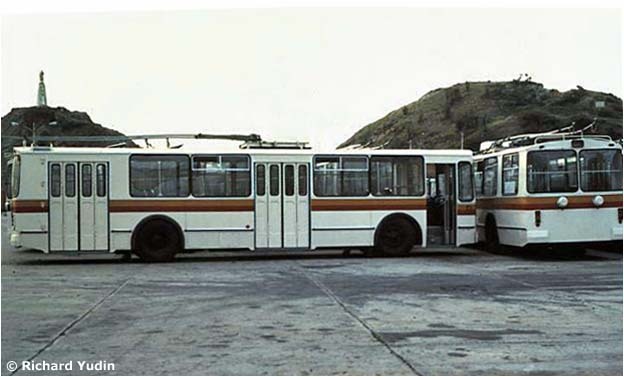 Data for its CCF-Brill trolleybuses, p. 96; DAC trolleybuses, p. 111; Uritsky trolleybuses, pp. 113-114. 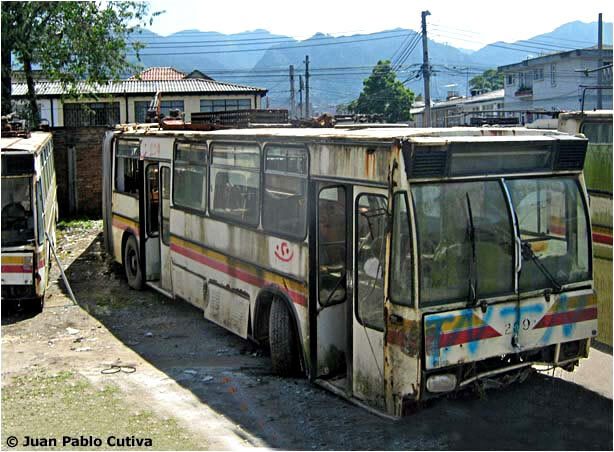 Buses de Colombia. 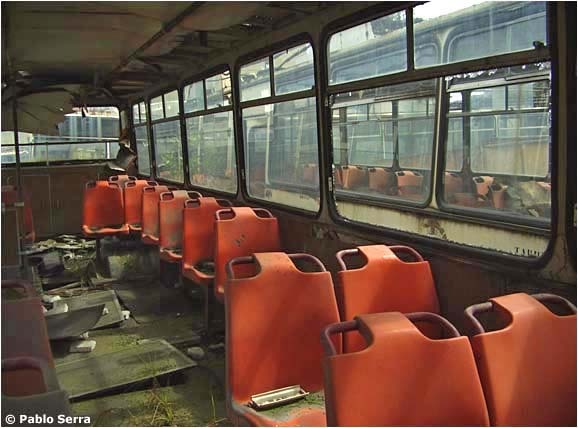 23 photographs of scrapped trolleybuses in the Trolebús section about half-way down the page. In addition to Claudio Bellon and the works mentioned above, the author is indebted to Gustavo Arias, Barry Blumstein, Allan de Koningh, Isaac Lima Díaz, Henry C. Peraza, Jacques Pèrenon, Francisco Rodríguez Charry, Juan Carlos Serna López, Dominique Stas, Richard Yudin and Juan Pablo Cutiva for the valuable information and illustrations that they provided.